In macOS Mojave in Dark Mode, dark colors are used in place of light colors in the user interface. For example, in Dark Mode the menu bar at the top of the Mac UI is no longer white with black text. Instead, it’s inverted so the bar is a dark color and the the text is white. That dark theme is carried throughout the UI. For some, Dark Mode may not seem like a big deal, but Dark Mode has many benefits. The higher contrast of text makes it easier to read documents and menu items. Using dark colors instead of white reduces glare, which in turn reduces eye fatigue. Most importantly, Dark Mode can improve your ability certain aspects of video and photos, such as color and detail. 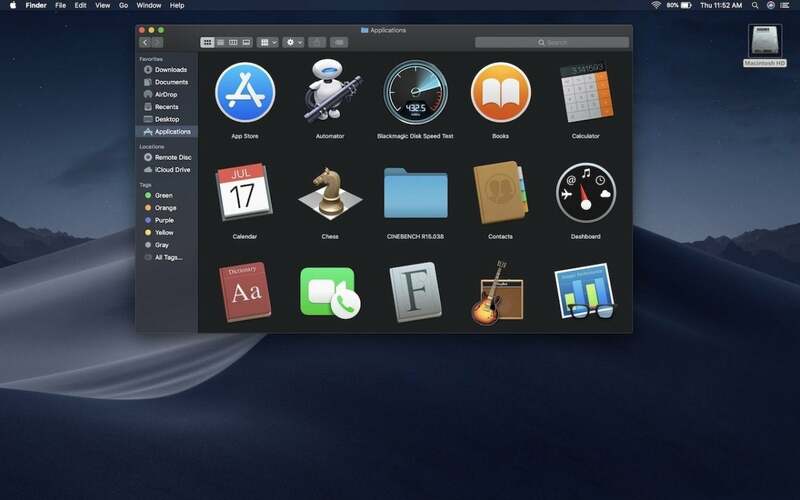 At macOS Mojave’s launch, all apps that are included in the operating system support Dark Mode. Apple is allowing third-party apps to use it, too, so if you want to use Dark Mode with a non-Apple app, check with that developer for an update. Dark Mode is very easy to activate in macOS Mojave. Give it a try, and if you don’t like it, you can always switch back. Here’s how to switch to Dark Mode in macOS Mojave. When you set up a new Mac, you’ll be asked if you want to try Light Mode or Dark Mode. But if your Mac is already set up and it’s in Light Mode, here’s how to switch. 1. Click on the Apple menu and select System Preferences. 3. At the top of the General preferences is Appearance. There are two buttons, one for Light and the other for Dark. Click on Dark, and you’ll see that the Mac will switch to Dark Mode. 4. Close the System Preferences. Notice that your desktop wallpaper doesn’t change in Dark Mode. Only UI elements change. Mojave has a new feature called Dynamic Desktop that doesn’t really make your desktop dark, but it does change the appearance of your desktop to match the time of day. Learn more about Dynamic Desktop.